Tom Liljenquist, a jeweler from McLean, Virginia, has donated his collection of 700 high quality ambrotype and tintype portrait photographs of Civil War soldiers to the Library of Congress. He and his three sons spent 15 years building the collection which they decided to donate so they would be preserved in digital perpetuity and so that these important images could be shared with the public without fees or restrictions. 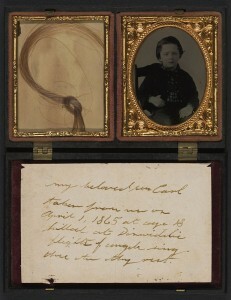 The collection represents an important resource in early photography. The ambrotype made use of the wet plate colloidion process on glass to create images that were cheaper than — and in some ways more attractive than — the daguerrotype. The tintype or ferrotype, which came into use at about the same time as the ambrotype — in the 1850s — was made by creating a direct positive images on treated iron metal. As an historical archive, the Liljenquist family collection shows Civil War garb, weapons, musical instruments and family portraits. Carol M. Johnson, curator of photography in the LoC’s prints and photographs division, calls the collection “a landmark gift.” Some of the rarer pieces depict Black uniformed soldiers and portraits of soldiers with their wives and children. Most of the pictures are unmarked so we don’t know who the subjects were or who photographed them, but a handful of notes of historical information pinned to the photo cases have survived. The picture on the right is a childhood portrait of a soldier named “Carl”. That’s a lock of his hair on the left and underneath the note from a parent says “My beloved son Carl taken from me on April 1, 1865, at age 18, killed at Dinwiddie. Flights of angels wing thee to thy rest.” The battles at Dinwiddie Court House (March 31) and and Five Forks (April 1) took place just 10 days before Lee surrendered at Appomattox on April 9th, 1865. The entire collection will be exhibited in April 2011, coinciding with the 150th anniversary of the start of the war, but the Library of Congress has been working assiduously to digitize the pictures and put them online. They’ve made sure to digitize all the pictures in their period cases, which are not only beautiful but valuable artifacts in and of themselves. Over half of the collection is online already, and new pictures are being added every week.